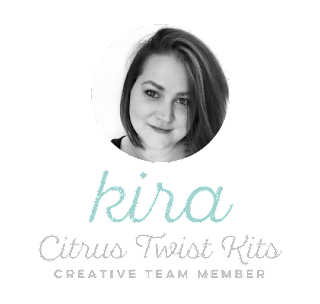 I started by using the Love Stuff cut file (which you can find on the Citrus Twist Kits website). I cut out the word "love" from white cardstock and then backed it with my favorite floral paper included in the Life Crafted kit. Then I used some white embroidery thread and handstitched around the cut file. I decided to scrapbook this adorable photo of my oldest son. He is just standing outside, using his blankie as a scarf and looking a little like a hipster. But I absolutely LOVE this photo of him. I tucked the picture into the V of the cut file. Since one of the prompts I chose was "use a cut file", I decided to search through the exclusive cut files to see if I could find even more to use. I absolutely loved the August 2018 Daisies, but never got around to using them. I thought they would work perfectly here. I backed all of the daisies with patterned paper from the LC kit and positioned them in a vertical pattern on my page. The flowers added so much to my page that I didn't have to include too many embellishments after that...but I still needed puffy stickers! I'm obsessed with CTK puffy hearts and was thrilled to see an ENTIRE sheet of them included in this months LC kit. I scattered a few up my page. And since more is more in my scrappy world, I also grabbed a puffy sticker from the scrapbooking add on kit to include on my page. I finished off my page with a tag stamped with "another day. another story." and the date, some typed journaling I included at the lower left corner of my page, and some very delicate splatters made with my Shimmerz Coloringz Night Moves mist. I can't wait to see how you use these prompts! Share with us in the Citrus Twist Kits Fan Page on Facebook!